I love teaching art. I really do. And I love my students. But they don't always love me. In fact, sometimes they hate me. Not because I'm overly critical; I actually do my best to be kind and supportive. Many art teachers give demonstrations for their classes. Anyone who has been to one knows they can be wonderful to watch. The best of them are like great performances. The artist/teacher paints, and the students watch, as a blank canvas magically comes to life. There's even a little applause at the end. One reason I've never done a painting demo is that they frighten me to death. That roomful of eyes watching my every move makes it difficult to concentrate and impossible to do anything great. The other reason is that painting is, for me, the most private of activities, so working in front of an audience feels about as natural as sleeping in front of one. Over time, I arrived at a method that felt comfortable enough to do well and valuable to my students. They don't passively watch while I paint. The students perform and I become the audience, discreetly circling the studio, making mental notes of their work, body language, focus and attention, even the way they breathe - which they sometimes forget to do. Giving equal time to the subject that they should be looking at, but usually aren't, at least not enough. Which brings me to why I am so disliked. It's the maddening habit I have of resolving, with a single brushstroke or comment, a painting problem that they've struggled with for an hour. And making it look easy in the process. No, I don't claim to be better, smarter or more talented than anyone else. free from the distraction of an unfinished canvas. is like listening while speaking. How many great listeners do you know? I happen to know just one. Most people talk more than they listen, just as most artists paint more than they observe. You simply can't do both at the same time. Observation is like listening with your eyes, but you have to be quiet for a moment (stop working) and just look, the longer the better. The problems creep in when your artwork consumes most of your attention. The moment your gaze moves away from your subject and toward your art, you're painting from memory. If the memory is a second or two old, that's fine, but if it's a minute or more, then you're just making stuff up. So what's wrong with visual memory? The mind has this peculiar way of smoothing things over, straightening things out, and making forms more perfect and symmetrical than they really are. All those wonderful little idiosyncrasies, the odd twists and turns that give things their character and visual truth are lost when we rely on memory. Good technique is essential. But while technique impresses, observation connects. The difference between a great technician and a great eye is in the response, "Your work is beautiful", vs. "I feel like I'm there!" An artist's vision is more like physical health than the ability to ride a bike - maintain it or it will decline, usually before you realize it. 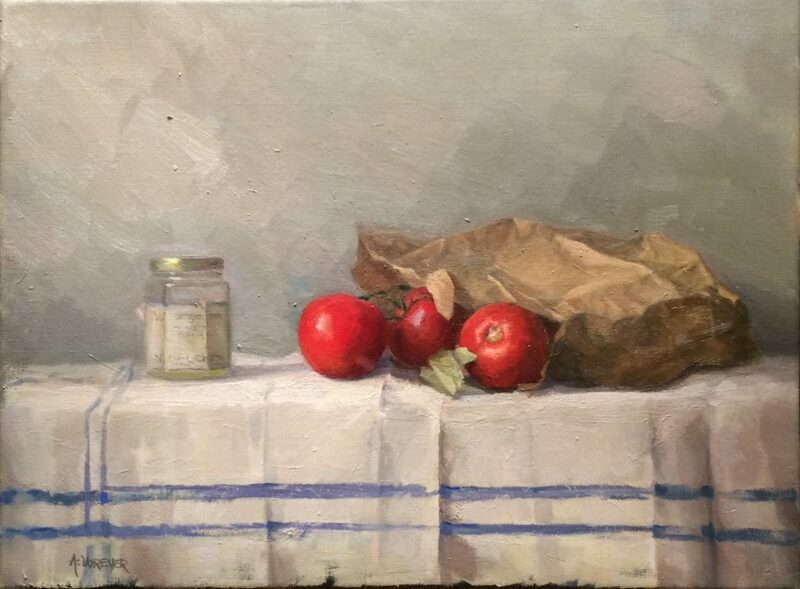 Annette Voreyer, Tomatoes and Jam Jar, oil on canvas, 18 x 24 in. Your seeing muscles need to be continually worked and stretched to be kept ahead of your technical skills. When the opposite happens and technique takes over, a problem that can haunt mid-career painters especially, vision weakens and the work starts to look artificial. This advice will sound dry to anyone coming to art as a pathway to self-expression and creativity. It may even be a letdown. We don't want medicine but a delicious meal. But think of creativity as an act of self-creation, rather than the production of anything tangible. Use your imagination to find new and exciting tools that increase your visual power. The habit I picked up, as a student, of turning the painting to the wall, putting the brushes down, and just looking for as long as possible, has made a world of difference in the work. So has trying to draw hundreds of near-perfect charcoal lines and circles, freehand on scrap paper, as an exercise in hand control. I still do both each day. Logging in countless hours is nowhere as effective as shaking up your routine. Forget about what everyone else is doing. Forget about how people respond to your work, whether it will sell, and forget about your age, if that's a concern. Just keep searching, be experimental, and remember, your most important creation is the artist - who creates the art. What a thoughtful and provocative position on the act of observation and painting. As someone who just started to learn to paint 4 years ago, this was a very intriguing post. You are almost suggesting some sort of training in mindful painting which for me, during plein air, is a challenge but I keep working at it. Yes, Kevin, that’s exactly it…mindfulness. Which is easy to overlook when all one’s attention goes into technique, but it makes all the difference! I loved how you write and express your truth. I am a great believer in painting what you see and it will turn out fine. Thanks very much, Leah, for reading, and for the lovely comment. Seeing IS like listening; so much so that I advocate asking questions of that which you are seeing. Asking questions stimulates the right mind and curiosity. The left brain cannot tell you what you see, or insist you remember what you saw, when the right brain is so actively discovering what is there. My students don’t understand the time gap between asking for suggestions and receiving my answer, until they get to know me, then they know I am being thoughtful. Of course, then they laugh at the unusual questions I ask them, unusual because no other art teacher ever asked those things. Yes, it is very good to watch. I’ve learned a lot from students, too. Very interesting perspective. I enjoy reading your thoughts! !